Increasing numbers of people rise before dawn to take part in Anzac ceremonies around Aotearoa New Zealand. Gathering reverently as the velvet blackness of night gives way to the first rays of the sun, people remember the sacrifices of those men and women who went to war, who risked and gave their lives to defend what they believed in. On the 25 April 1915 soldiers from New Zealand and Australia landed on the Gallipoli Peninsula in Turkey. Fighting as part of ANZAC (Australia and New Zealand Army Corp), the battle was devastating, over one third of New Zealand soldiers dying in a fight that did not have any significant effect on the war. Anzac Day remembers this sacrifice, but it also marks a moment when New Zealanders took pride in the qualities of the soldiers who fought at Gallipoli – bravery, tenacity, practicality, ingenuity and loyalty – and turned these characteristics into part of our identity, a way of distinguishing ourselves in the world, of knowing who we are and what makes us great as a people and a nation. Bravery, tenacity, loyalty. These are noble qualities and we rightly remember the men and women who have shown such qualities with honour. But there are another group of men and women who, never going to war, showed the same integrity and courage to stand up for what they believed. Lest We Forget: Remembering Peacemakers on Anzac Day marks the honourable actions of those individuals who believe war is wrong, and who have risked physical harm, their freedom and their reputations, to bring their message to others that war is never right. In a time when war is widely condemned if still too prevalent, it can be hard to imagine what hardships these peacemakers endured. Harry Urquhart publicly wrote in opposition to the First World War, and as a result he lost his job as a teacher. When he wrote a pamphlet challenging compulsory conscription, he was sent to jail for eleven months for sedition, and then jailed again for refusing to be conscripted. He lost his right to vote for ten years, and was banned from teaching. 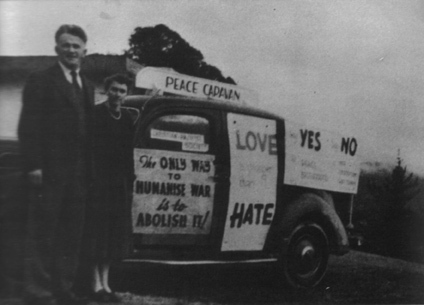 Archibald Baxter, a pacifist and Christian socialist, refused to take part in the First World War. He was first sent to a detention camp and then forcibly shipped to the front in Europe, where they were humiliated and punished, denied food and placed in mortal danger. All this because he refused to fight in a war he did not believe in. In 1949 Archibald Barrington (pictured) and 20 members of the Riverside community protested the government’s plan to reintroduce compulsory military training. Barrington was attacked by a group of returned soldiers in the crowd and forced into a toilet where the men tried to flush his head inside the toilet bowl. He was then charged and convicted of disturbing the peace. There are many such stories, some of which are told in this booklet. We invite you to remember, on the 25 April, men and women who have made the decision to sacrifice and risk so that we might live in a more peaceful, just and hopeful world.